Mayor Martin J. Walsh was among those who joined the Boston Prep community on Saturday, September 8 for a ribbon cutting ceremony celebrating the completion of construction of the school’s new comprehensive middle and high school facility located at 885 River Street in Hyde Park. The culmination of three years of construction, the new facility offers enhanced learning opportunities for Boston Prep’s sixth through twelfth grade students from throughout the city of Boston. In line with the school’s mission to prepare all students to succeed in four-year colleges, the new facility supports a college preparatory curriculum, including a design center, fully equipped science labs, classrooms equipped with fully integrated technology, breakout rooms for small group support, two cafeterias, and a gymnasium. The new facility offers the school expanded physical space, allowing the school to grow student enrollment from a current 530 students to 700 students, providing greater access to the many Boston families on the school’s extensive wait list for lottery admission. 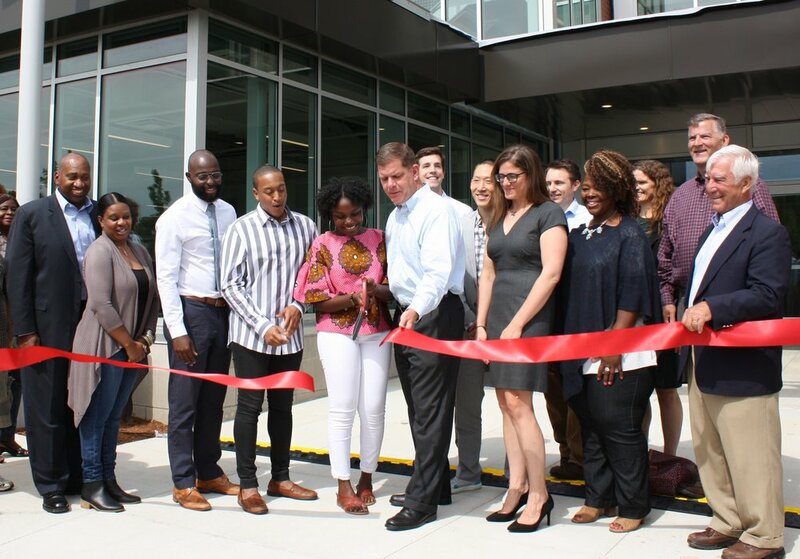 Following a speaking program, Mayor Walsh, Representative Russell Holmes, and Representative Angelo Scaccia joined Boston Prep students, faculty, alumni, family members, and Board members to cut a ribbon in celebration of the project completion. A $40 Million project in total, the school’s capital campaign has raised over $11 Million in capital campaign funds to support construction, in addition to securing supplemental financing. Public charter schools do not receive the same state subsidies that district schools receive to finance their facilities. Therefore, they must use operating revenue augmented with fundraising efforts and financing to construct their school buildings. As the school year begins, the school leadership team is working to complete fundraising efforts and cross the finish line. Click below if you wish to make a gift to the capital campaign today.